Living Whist was performed on Mansfield Colliery Welfare grounds by Forest Town School children circa 1942/3. 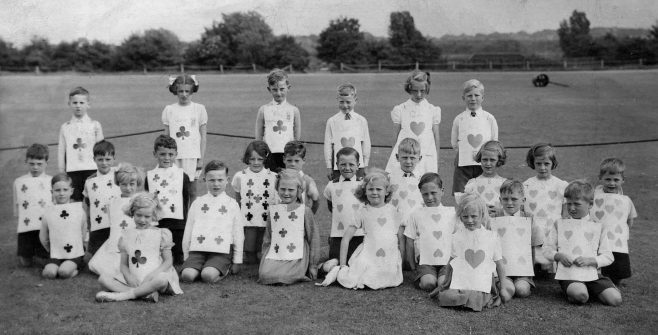 Fifty two children were each dressed as a playing card. There were four canvas square screens erected at equal distances to form a square. Four volunteers (adults) were chosen to play whist. Music played and all the children danced round in whatever way they chose, in doing this they were shuffling the pack of cards. When the music stopped thirteen children went into the nearest screen and these represented a hand. Someone declared Trumps and then play began. Each player sent out a card just as they would if playing a normal game. When a trick was won the four cards would go to stand against whoever had won the trick. The game proceeded just as a normal game until a winner was declared. Katherine Meadows, ? Meadows, ? Belcher. Major T S Martin FRSA. Mansfield Art College 1969 / 70. QEGS (boys) and my memories of 1930s and 1940s Mansfield. Rainworth Royal Wedding Celebration 1981 Street Party and Heathlands. Rainworth Silver Jubilee 1977, Street Party and Heathlands. Sherwood Hall School for Boys.